In reading about the various practices and strategies of high frequency traders, one of the most mysterious to me is "fleeting orders," or orders that are cancelled almost immediately after they are sent (see Hasbrouck and Saar (2011)). Why do HFTs use these orders? Some of those trying to explain the practice claim it gives HFTs an informational advantage. How? What information do they get and how do they use it? I am hoping for someone with actual experience in HFT to answer and verify some of the hypotheses laid out by academics. In particular, one hypothesis is that rapidly cancelled limit orders bring forth market orders on the other side, which are then executed at a less favorable price also placed by the HFT. In other words, HFTs are gaming the system to exploit sub-optimal behavior by slower traders. Is there any evidence of this still occurring, now that the practice of fleeting orders is widespread and well known? This explanation would also imply that it is relatively simple to avoid being taken advantage of, thus weakening the policy implications. Is there some reason that slower traders prefer sending market orders only after seeing a limit order meeting their price target? All HFTs are event driven. In the most basic sense, they have some model that is a function of order book events. For every order book event the model calculates some micro price that is the HFTs perceived fair value. This is often a function of the current bid, ask, depth, last n trade prices, inventory, etc. Given the most up to date view of fair value, the HFT will be adjust orders in the market. As you can imagine, the rate of events for order book data is very high. This results in a very high scratch rate (cancel to fill ratio) because the HFT is adjusting their orders at a rate similar (but not equal to) the event arrival rate for a given stock. The likelihood that there are shenanigans going on is non-zero. However, the use of said shenanigans is not wide spread, IMO. My favorite culprit is quote stuffing, which can be used for a lot of things, including mapping the topology of the exchange servers themselves. The general idea is to look for bottlenecks which can then be lagged with more targeted quote-stuffing to create arb opportunities. Based on my experience trading DJ Eurostoxx 50 (FESX), the HFTs place and delete the orders almost immediately to fool other algorithms which are based on limit order quantity at various prices. I have used a technique to scalp of a few ticks when such a phenomena occurs. For instance if the HFt places an order for 1000 lots at 2000 and immediately it disappears, but the market price moves up and down by a few ticks. This is because other algorithms are designed to operate on certain order imbalance etc. Hence if I see a huge order on bid side, I used to sell some lots and immediately scalp off a a couple ticks. I used to do this and make some money during such hours. This stuff mostly happened during dull hours. My 2 cents. For example, high frequency market makers use all the market microstructure to take decisions of how many stocks put in each side. This microstructure can be a 5 level data (ten prices, 5 bids and 5 asks with the quote amount or quantity) so they calculate and quantify the order book imbalance or other type of measure of the supply/demand of the order book. To modify the market they post some limit orders and send orders in different prices to try to balance the book order and also because they use this type of orders for the risk management of the strategy. Not the answer you're looking for? Browse other questions tagged high-frequency market-making or ask your own question. 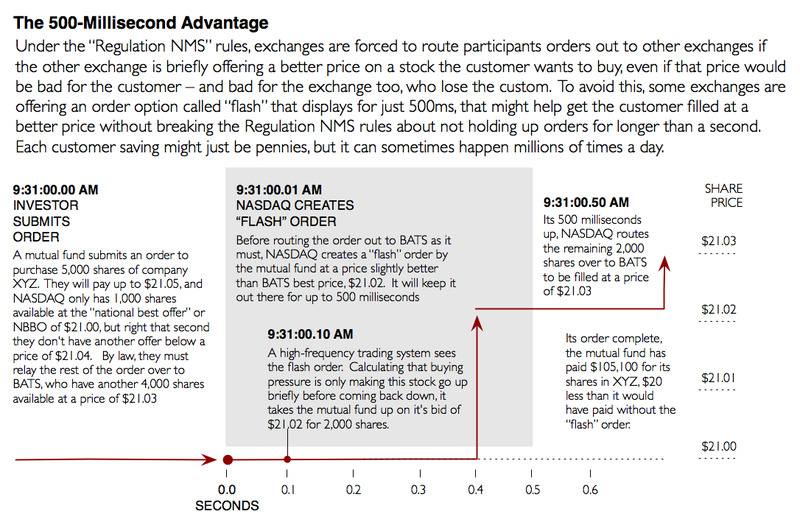 High-Frequency Traders and Front Running: What order types are they using?